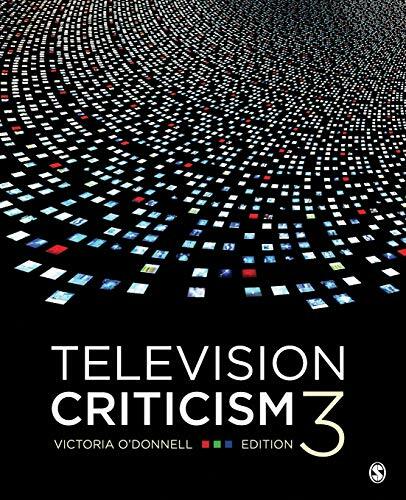 Television Criticism, Third Edition by Victoria O′Donnell provides a foundational approach to the nature of television criticism. Rhetorical studies, cultural studies, representation, narrative theories, and postmodernism are introduced for greater understanding and appreciation of the critical perspectives on television with in-depth methods of criticism. Illustrated with contemporary examples, this updated Third Edition includes a new, extensive sample critical analysis of The Big Bang Theory and reflects recent changes in the ways television is viewed across multiple devices and the impact of the Internet on television. Victoria O’Donnell is Professor Emerita and former director of the University Honors Program and Professor of Communication at Montana State University–Bozeman. She also taught a seminar in television criticism for the School of Film and Photography at Montana State University. Previously she was the chair of the Department of Speech Communication at Oregon State University and chair of the Department of Communication and Public Address at the University of North Texas. In 1988 she taught for the American Institute of Foreign Studies at the University of London. She received her PhD from the Pennsylvania State University. She has published articles and chapters in a wide range of journals and books on topics concerning persuasion, the social effects of media, women in film and television, British politics, Nazi propaganda, collective memory, cultural studies theory, and science fiction films of the 1950s. She is also the author (with June Kable) of Persuasion: An Interactive-Dependency Approach, Propaganda and Persuasion (with Garth Jowett), Readings in Propaganda and Persuasion: New and Classic Essays (co-edited with Garth Jowett), Television Criticism, and Speech Communication. She made a film, Women, War, and Work: Shaping Space for Productivity in the Shipyards During World War II, for PBS through KUSM Public Television at Montana State University. She has also written television scripts for environmental films and has done voice-overs for several PBS films. She served on editorial boards of several journals. The recipient of numerous research grants, honors, and teaching awards, including being awarded the Honor Professorship at North Texas State University and the Montana State University Alumni Association and Bozeman Chamber of Commerce Award of Excellence, she has been a Danforth Foundation Associate and a Summer Scholar of the National Endowment for the Humanities. She has taught in Germany and has been a visiting lecturer at universities in Denmark, Norway, Sweden, and Wales. She has also served as a private consultant to the U.S. government, a state senator, the tobacco litigation plaintiffs, and many American corporations. She is an active volunteer with Intermountain Therapy Animals, taking her Golden Retriever, Gabriel, to the elementary schools where the children read to the dog in the R.E.A.D. program. She writes children’s stories about Gabriel. She is currently writing a novel about Ireland.